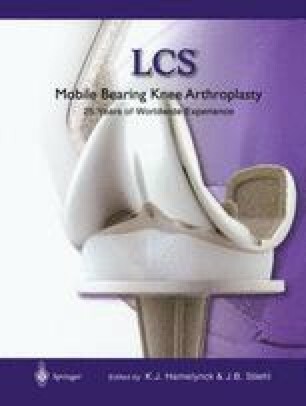 The LCS Total Knee System was introduced in 1977 by doctors Frederick Buechel, M.D. and Michael Pappas, Ph.D. as the New Jersey LCS (low contact stress) Knee. The original LCS knee was available in three main design variations, including the Rotating Platform Knee, which was designed to sacrifice both the anterior and posterior cruciate ligaments, the Bi-Cruciate Retaining Meniscal Bearing Knee (a design that saved both the anterior and posterior cruciate ligaments),and the Posterior Cruciate Retaining Meniscal Bearing Knee, a posterior cruciate ligament sparing design. All three variations of this knee were initially sold for use as uncemented knees. The uncemented variations of the knee gained acceptance in United States, as well as in Europe and in Australia, New Zealand, and South Africa. Approval for use as a cemented knee was granted in the United States in 1985, and the first publication that described early results of the LCS Mobile Bearing Knee was published in 1986 .